Award winning and versatile soprano, Elena Xanthoudakis is an expressive performer whose enthusiastic reviews speak of her captivating and engaging performances. Recent engagements include her debut in the title role In Donizetti’s Anna Bolena at Melbourne Opera, the title role in Donizetti’s Pia di Tolomei at English Touring Opera, Donna Anna in Don Giovanni for Winslow Hall Opera, Giulietta in Bellini’s I Capuletti e I Montecchi at the Greek National Opera, the title role in Donizetti’s Maria Stuarda for Melbourne Opera and Pamina in Die Zauberflöte for Opera de Quebec, a role she also sang at English National Opera and the Clarion Music Society in New York. She has also appeared as Adina in L’elisir d’amore in Singapore and for Scottish Opera. At the Royal Opera House Covent Garden Elena sang both Lisa and Amina in La Sonnambula as well as Frasquita in Carmen and she covered both Gilda in Rigoletto and Countess Adele in Le Comte Ory at the Metropolitan Opera in New York. Other past engagements include Miss Schlesen in Glass’ Satyagraha at English National Opera, First Niece in Peter Grimes with the Accademia di Santa Cecilia in Rome, Rota’s Mysterium with the Verdi Orchestra in Milan, Gilda in Rigoletto for Opera Queensland and the title role in Lucia di Lammermoor and Violetta in La Traviata, both for Winslow Hall Opera. On the concert platform Elena performed Mozart’s Requiem with the Melbourne Symphony Orchestra, Beethoven’s Mass in C with the Scottish Chamber Orchestra with conductor Louis Langrée and the Carmina Burana at the Royal Albert Hall with the London Philharmonic Orchestra. Other works on her concert repertoire include Beethoven’s 9th Symphony, Rossini’s Petite Messe Solennelle and Stabat Mater and the Vivaldi and the Poulenc Gloria’s. 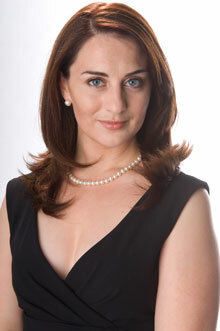 Elena holds a Bachelor of Music with Honours and a Graduate Diploma of Opera from the Victorian College of the Arts as well as a Master of Music Performance degree from the University of Melbourne. While on scholarship at the Guildhall School of Music and Drama, London, she also received her second Master of Music with distinction. She undertook studies in part of the young artist programme at the Maggio Musicale and the Harewood Young Artist Programme ENO. Elena Xanthoudakis is a Borletti-Buitoni Trust Artist.